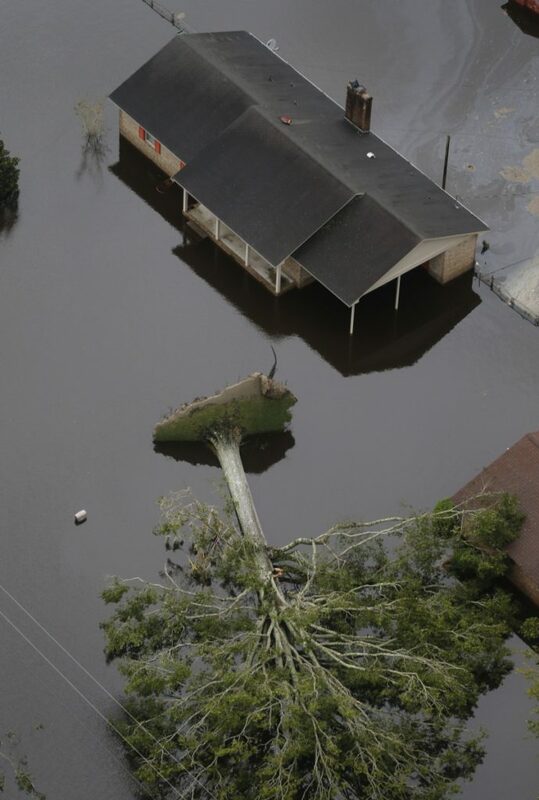 Authorities evacuate a family from rising waters caused by Florence, now a tropical storm, on Saturday in New Bern, N.C.
A downed tree uprooted by Hurricane Florence likes next to homes in New Bern, N.C., on Saturday. 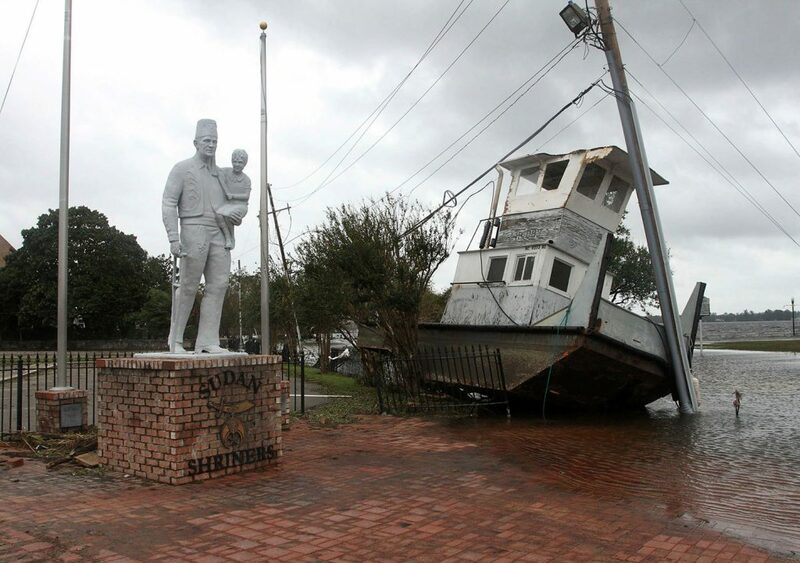 A tug boat sits next to a Shriner's Temple statue on East Front Street in New Bern, N.C., on Saturday. 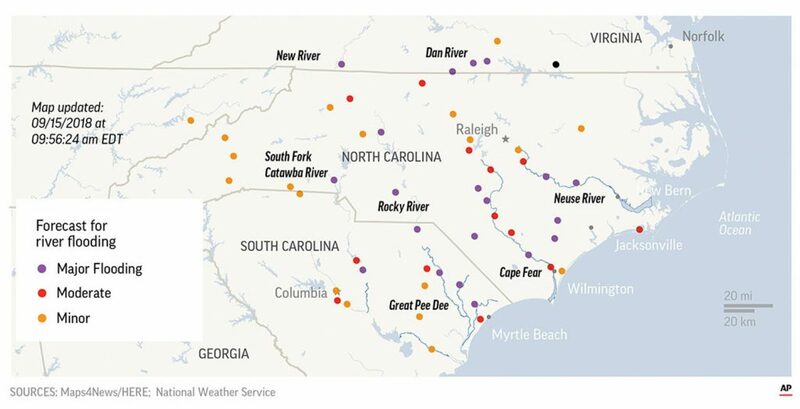 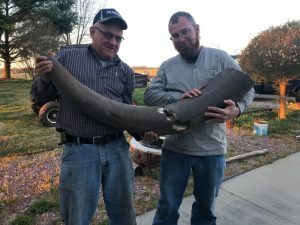 The boat washed up from the Neuse River with storm surge and debris from Hurricane Florence. 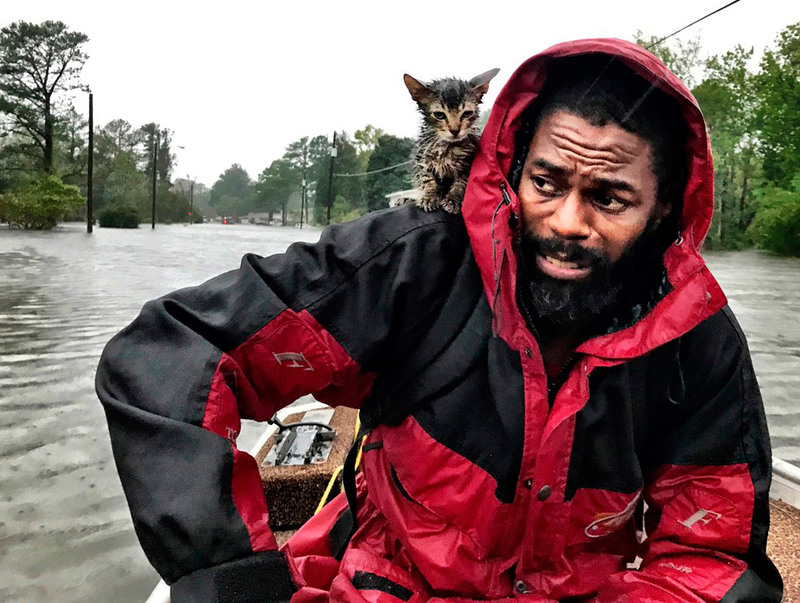 Robert Simmons Jr. and his kitten, Survivor, are rescued from floodwaters after Hurricane Florence dumped several inches of rain in the area overnight Friday in New Bern, N.C.
A boat rests between the shifted roof of a garage and a damaged home from tropical storm Florence in New Bern, N.C., on Saturday. 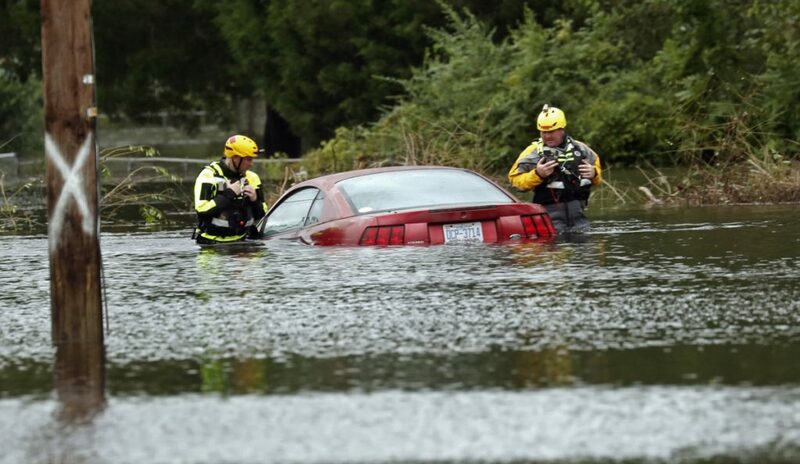 Members of a swift-water rescue team check a submerged vehicle stranded by floodwaters caused by the tropical storm Florence in New Bern, N.C., on Saturday. 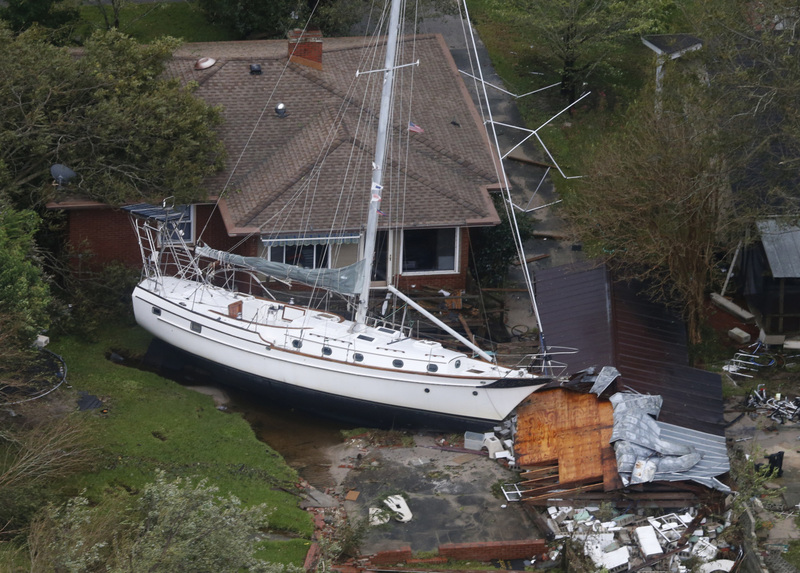 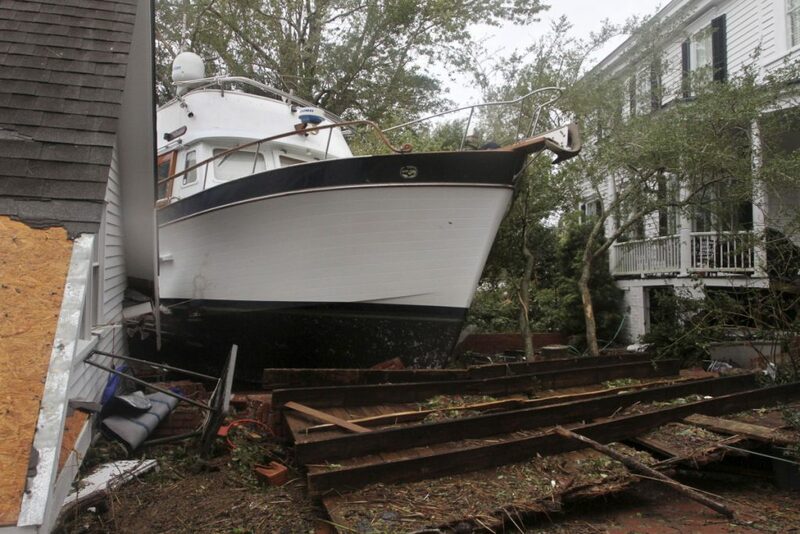 A sailboat is shoved up against a house and a collapsed garage Saturday after heavy wind and rain from Florence, now a tropical storm, blew through New Bern, N.C. 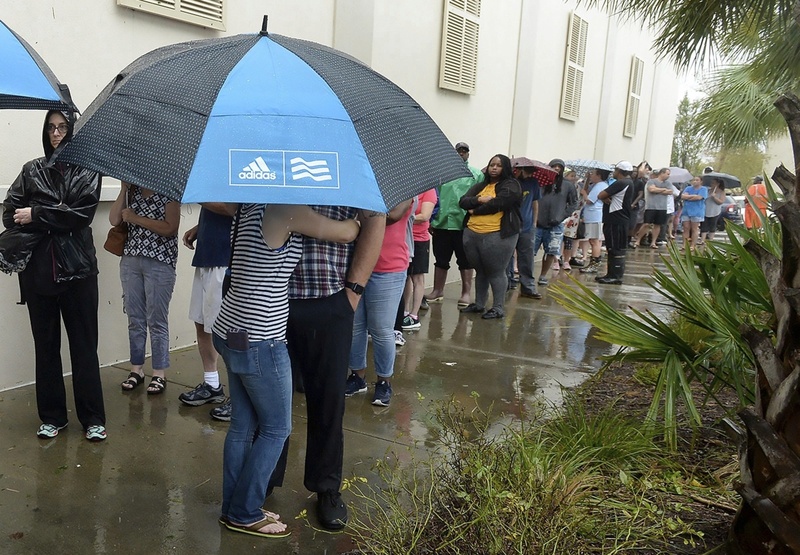 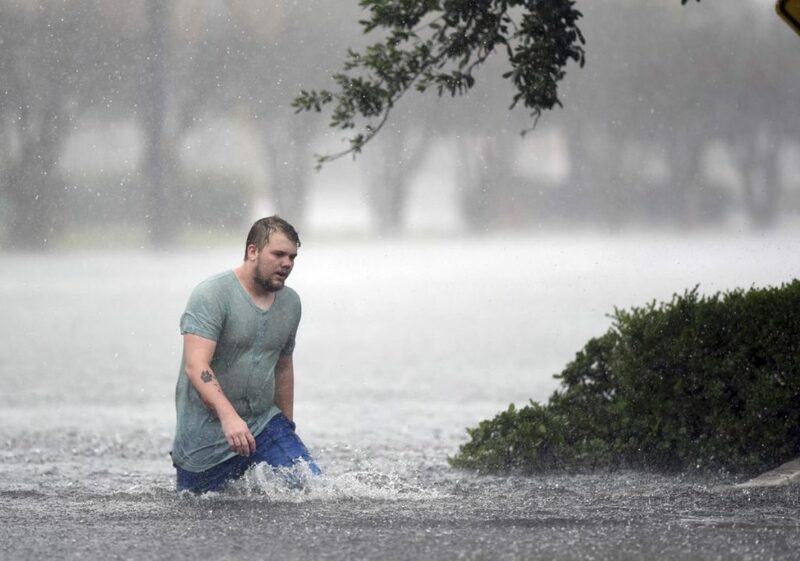 Hundreds line up as a Harris Teeter Supermarket opens its doors Saturday following Florence, now a tropical storm, in Wilmington, N.C.
Jake Head walks through heavy rain from tropical storm Florence in Wilmington, N.C., on Saturday. 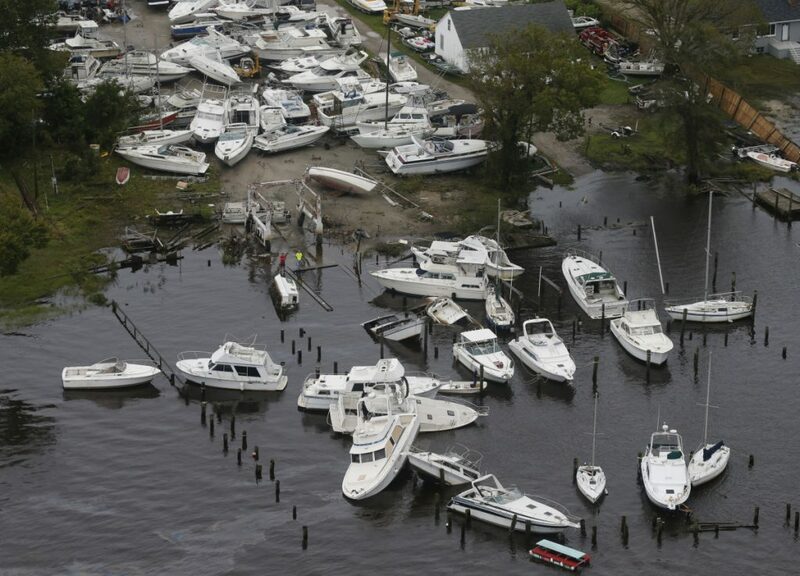 Boats are stacked up on each other in a marina as a result from Florence in New Bern, N.C., on Saturday. 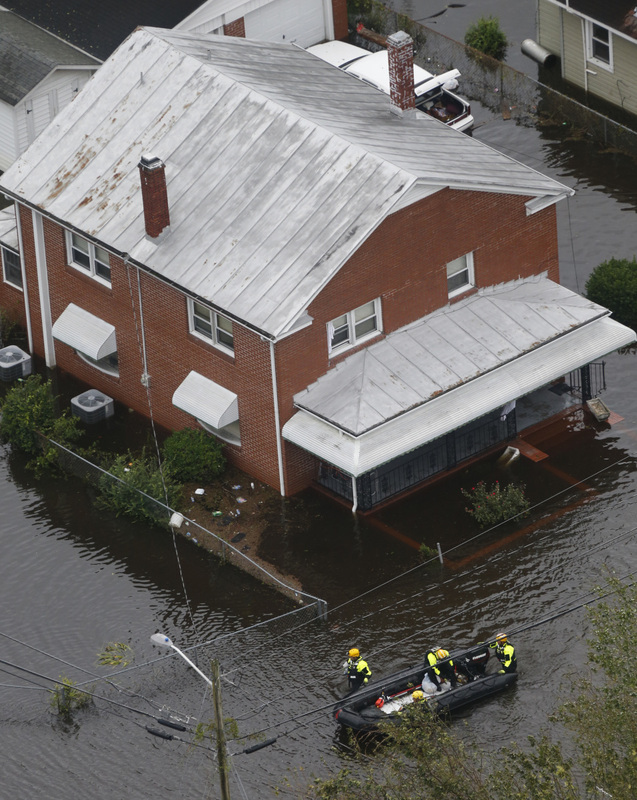 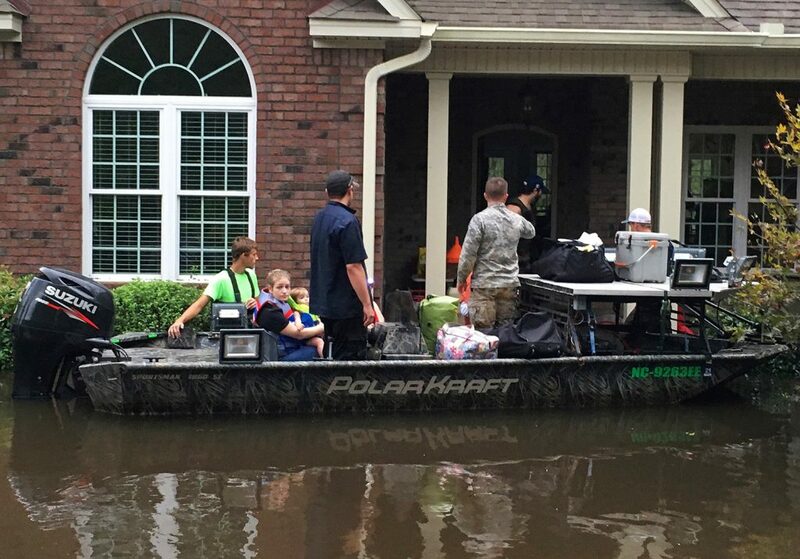 Rescue personnel use a small boat as they go house to house checking for flood victims from tropical storm Florence in New Bern, N.C., on Saturday. 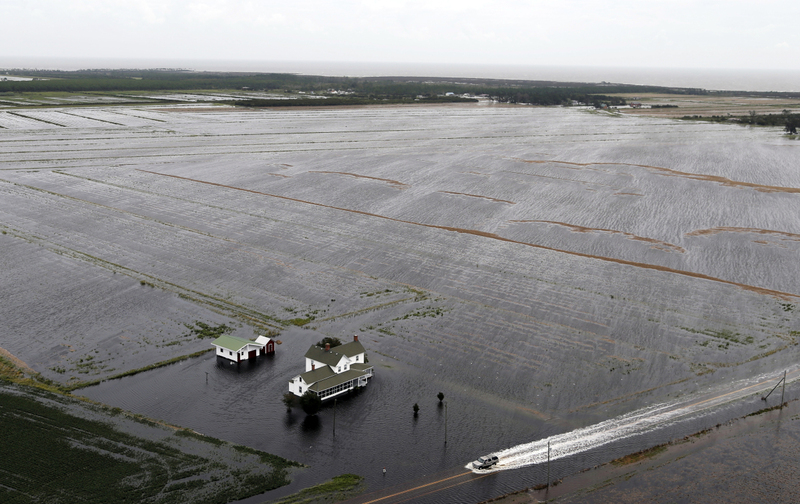 A pickup truck drives on a flooded road past a farm house that is surrounded by flooded fields from tropical storm Florence in Hyde County, N.C., on Saturday. 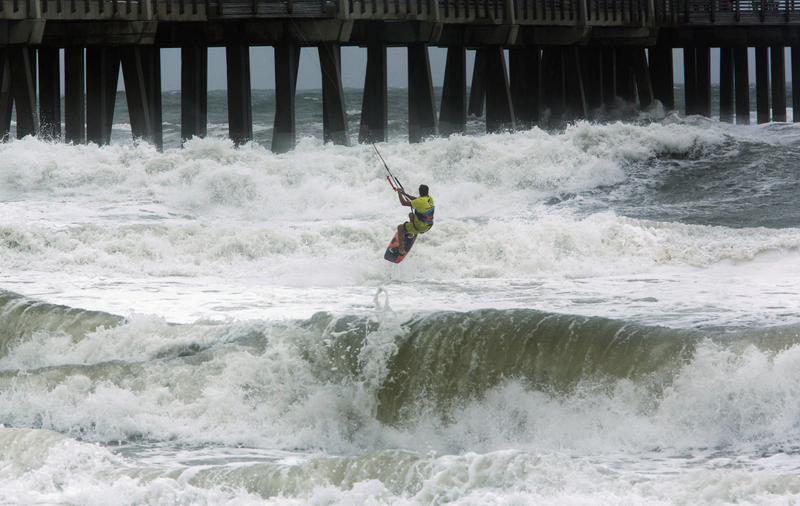 Kite Boarder Dimitri Maramenides heads out next to Jennette's Pier in Nags Head, N.C., as Hurricane Florence makes landfall farther south on Friday.